Chia is a seed from the plant Salvia Hispanica. 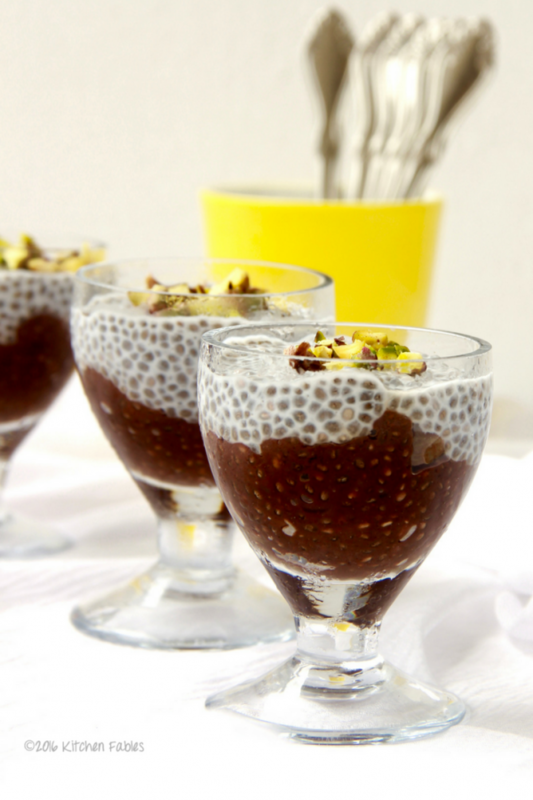 Chia seeds have gained popularity in India in last decade. Chia seeds are packed with Omega-3 fatty acids, Protein, Dietary Fibre, Antioxidants and Calcium. 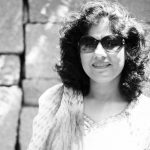 I started including chia seeds in my diet about 3-4 years back. Chia seeds provide nutrition without much calories. I add chia seeds to porridge, drinks etc. The fibre in the seeds makes one feel fuller for a longer time, which is great when you are watching your weight. Chia seeds are easily available on Go India Organic. A packet was send to me for product review through Plattershare. As the festive season is arrives there will be many get togethers and parties. Most people who have diabetes or other health issues either feel deprived or end up eating food that they should not be eating. So I thought of doing a dessert which does not need refined sugar & is a healthier option. I also feel making dessert in smaller servings is a good idea as it helps in portion control. This is an excellent dessert for my Vegans as well. 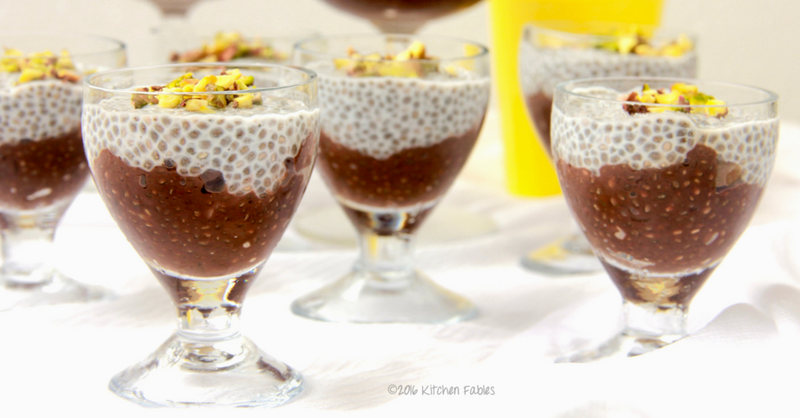 This dessert has two layers , Chocolate with Chia, Nuts and Dry Fruits and the top layer is Coconut milk and Chia. In the chocolate layer I have added a date syrup to compliment the cocoa flavour. In the Coconut Milk and Chia layer I have not added any sugar as the coconut milk has it natural sweetness. If you want you can add a sweetener of your choice to it. Similarly mix chia seeds and coconut milk and refrigerate for 3-4 hours. 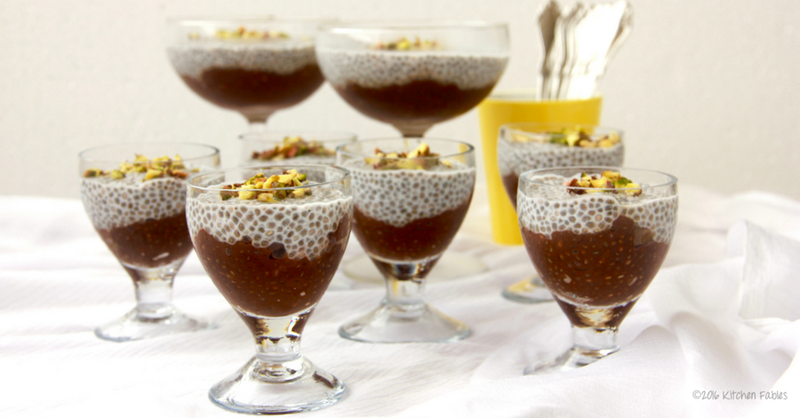 Chia seeds absorbs the liquid and you will get a thick pudding. 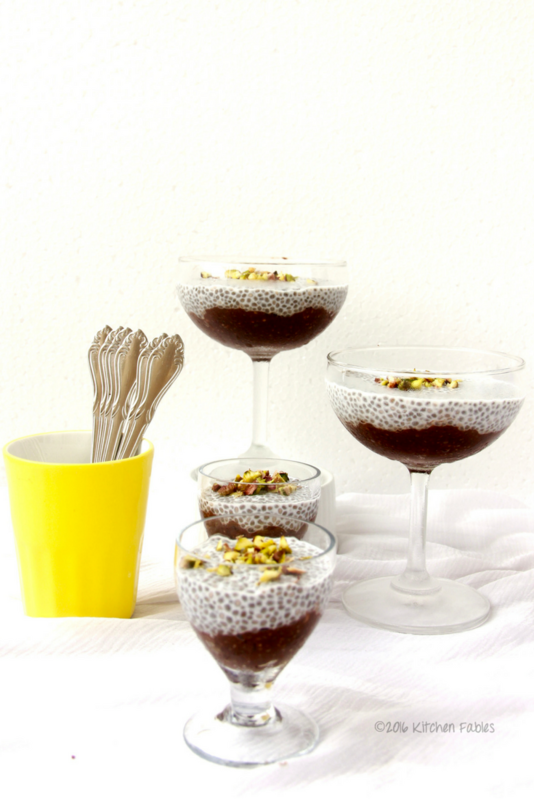 Layer it in dessert cups / bowls and garnish with pistachio. Refrigerate again. Serve cold. I would love to hear from you on how the recipe turned out for you, please leave a comment and rate it. Good to note that you have not used sugar. Will try this for sure!